2) Cut the rested dough into parts of 40 – 60 gram each, for big-sized moon cakes (depends on how big your mould is). You may form each part into ball, for easy making into moon cakes. 3) Same to the lotus paste. 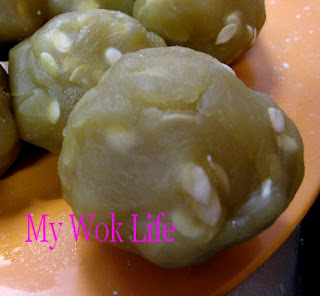 Mix melon seeds into lotus paste. Then, form lotus paste into large lumps of about the size of tennis ball (try one out to see if the amount is correctly used). 4) Roll out each dough ball (flatten it using finger tips will do) into thin sheet with the size of the sheet not too much larger than your palm size. 5) Place the thin sheet on your clean and lightly floured palm, and place one lump of lotus paste ball on top of the sheet. Lightly press and spread it out on the sheet. Place and wrap 1 yolk in the middle of the lotus paste. If without adding yolk, simply wrap a lump of lotus paste and seal with the dough skin. 6) Wrap and seal the lotus paste and yolk in the dough. 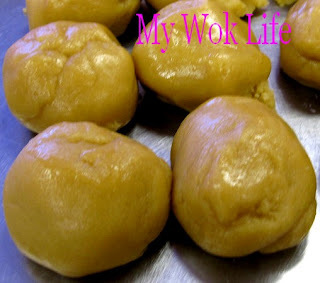 Lightly flour the moon cake dough after sealed and shaped circularly. 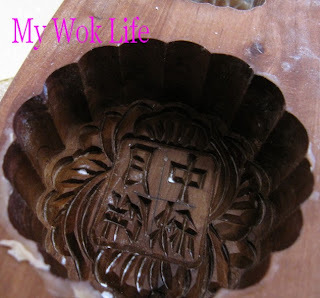 7) Clean moon cake mould and dry it completely beforehand. Then, lightly flour the mould before placing the moon cake dough into it. 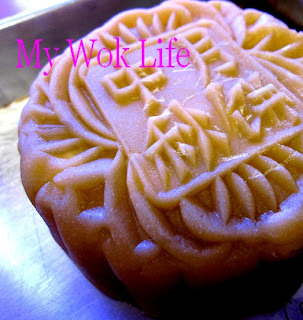 8) Place moon cake dough in and press firmly to get a clear indention of design on the surface of mooncake. The dough should be completely occupied the space of the mould without any excess around the border. 9) Now, be ready to knock out the moon cake dough. Place a thick book or large wooden chopping board on a solid table top. 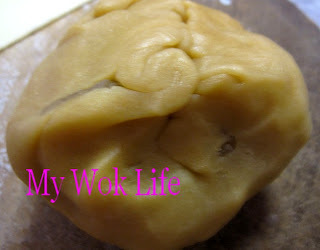 Overturn the mould and knock out moon cake dough with strength. To knock out the cake easily: You may first knock the top of the wooden mould against the thick book or chopping board, followed by the sides, one hit each of left and right side, before overturn the mould to remove moon cake from it. I personally think it is easier to use the plastic mould. Less flour should be dusted on it. 10) Place moon cakes on a greased baking tray. Bake the moon cakes on the top rack at 190°C, for about 10 minutes, or until light brown. 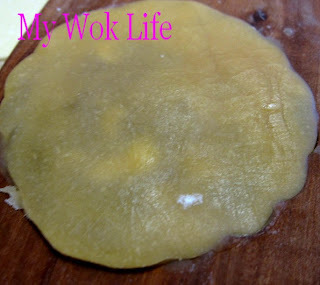 Remove from oven, brush (lightly) the surface of lightly browned moon cakes with egg yolk. Place moon cakes back to the oven and bake with same temperature for another 6 – 10 minutes, or until moon cakes are golden brown. Remove moon cakes from oven to cool before serve, or store in a nice packaging as festive gift to you family and friends! This traditional baked moon cake can be stored up to 2 weeks. 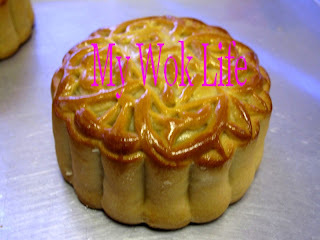 One large lotus paste with single yolk moon cake counts about 800kcal! Eat moderately, please, especially with yolks in it, even if you are eating it just once a year. Tips: If you prefer darker moon cake skin colour in appearance, you don’t bake it longer for the darker tone effect as it won’t help. 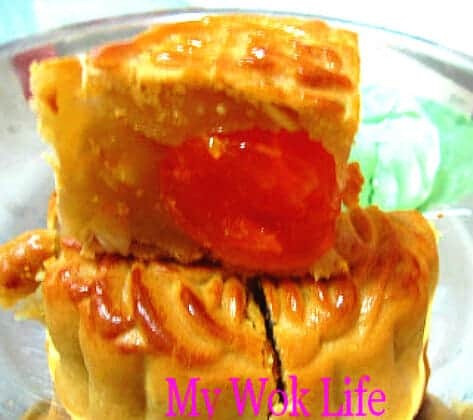 What you do is to place the completed moon cakes dough (already wrapped with lotus paste in it) on the table to ‘breath’ for 2 – 3 hours, before placing into the mould to shape, and bake. After breathing the dough, the baked moon cakes will be presented in darker skin colour. * May reduce oven temperature to 180°C, if dough rested for more than 12 hours. 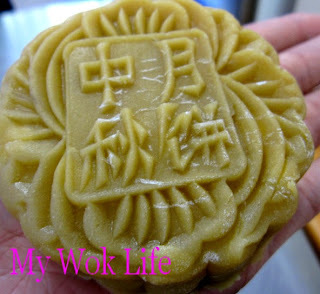 * How to measure how much lotus paste to use for one moon cake: gauge and take 1 lump of lotus paste, and place inside the mould. 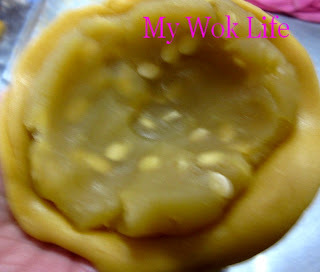 The lump of lotus paste should not occupied the whole mould but leaving a small gap around the mould for moon cake skin. If add egg yolk, reduce the weight of lotus paste with the weight of egg yolk added. For examples: 1 mooncake requires 200 grams of lotus paste. If add 1 egg yolk weights 20 grams, 200 grams minus off 20 grams = 180 grams of lotus paste to be used for 1 single yolk lotus paste moon cake. 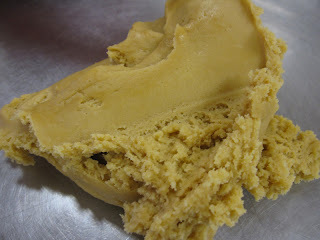 It’s also ok, if you realise insufficient lotus paste used only when you already pressed it into the mould, just open up the dough skin to stuff in more lotus paste (need not to remove whole dough from mould), and seal it back again will do. Even if it’s not nicely shaped, remove and reshape it, too! * Weight of golden syrup should be measured in term of gram (g), NOT mililitres (ml). * Alkaline water is available in major baking supplies stores or supermarkets (baking section). It has to be added for smoother skin texture. * Type of flour can be low-protein flour, multi-purpose flour, top flour or Hong Kong flour. Sift or not sieved, both are OK.
* Add 380 gram of flour first, if texture appears too dry (like bread crumb texture), add 20 gram more, to make up to 400 grams and use bare hand to knead and form into dough. * Do not over-brush the egg solution on top of the moon cake as it might affect the design on its surface. Thank you so much for sharing your mooncake recipe. =) Am noting down the ingredients for shopping! Just made some mooncakes today following your recipe. But somehow my mooncake skin turn out to be hard like biscuit!! I am not sure why but you have to follow exactly in order to yield good result. I don’t think mxture of flour will work and long baking might make the mooncake harder. Plus, baked mooncake is actually best to consume after overnight or even two days later. So, you may see if it softens bait after two days? Not necessary to store in fridge. Cool place will do. I would like to piglets out of the flour. Where can I buy the mould and plastic pig cages? Many major supermarkets and hypermarkets such as Giant, etc, will sell it. Or, try baking supplies shops like Phoon Huat. I go AMK Ave outlet, but you may Google its name to find other outlet locations.